Our complete and balanced Glucerna® Powder and ready-to-drink nutritional shakes can be used as a low calorie meal replacement and/or snack. They are designed specifically to help you manage your blood glucose levels as part of an overall diabetes management plan. Our products contain a unique, slowly digested carbohydrate blend to help minimise glycaemic response. Clinically proven to optimise glycaemic response2. Caution: For use under medical supervision. 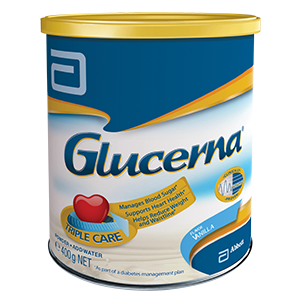 Glucerna® 400 g powder standard dilution is 6 scoops to 200 ml cold water. Mix well. Vitamin A (Palmitate), Vitamin A (Beta-Carotene), Vitamin D3, Vitamin E, Vitamin K1, Vitamin C, Folic Acid, Thiamin (Vitamin B1), Riboflavin (Vitamin B2), Vitamin B6, Vitamin B12, Niacin, Pantothenic Acid, Biotin, Choline, Sodium, Potassium, Chloride, Calcium, Phosphorus, Magnesium, Iron, Zinc, Manganese, Copper, Iodine, Selenium, Chromium, Molybdenum. Adapted from Glucerna® SR Product Monograph.